Morning all. 0500 Tuesday, 17 hour into the race and a beautiful moon in the sky at the moment, which will be full tomorrow night, and it’s like having the lights on. Very bright moonlight. That’s the exciting news out of the way as we’re going nowhere fast. There’s very little wind to speak of and we’re just bobbing around watching the other boats on the tracker carting along in double figures. Our plans to lure the opposition in to a false sense of security are working perfectly. 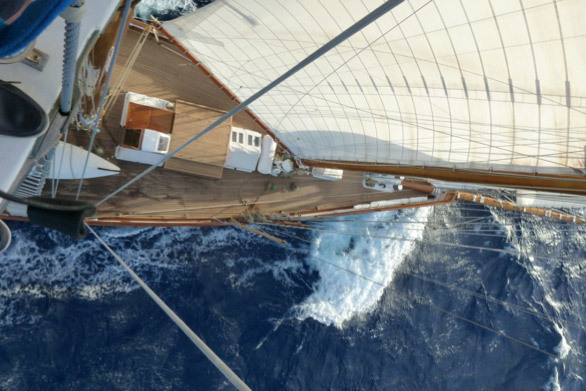 We’ve gone up against five modern boats in a big old schooner and headed south where the others went around the top of Tenerife. 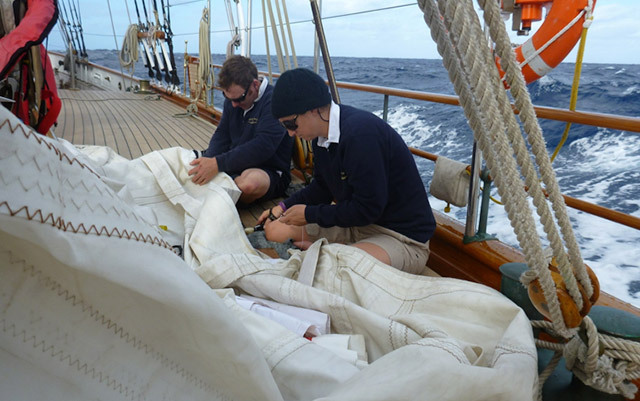 Furthermore, we tore the leech on the mizzen sail yesterday during hoisting and we’ve had a team working throughout the night to hand stitch it back together. The reason for sailing south was to avoid the big swell up north. Shenandoah may be a big schooner but we have to treat her with love and care. Hopefully we’ll be out of the wind shadow soon and into some freshening breeze. It’s all been happening on Planet Shenandoah in the last 24 hours and the last time I posted I was bemoaning the fact that we were still having no luck with the wind. That lasted until about fifteen seconds after I hit the enter key at which point the wind started to build, and before you knew it, we were barrelling along, touching 12 knots at times. Down below, Chef had prepared us a sumptuous monkfish curry, which I over-stood on. It was so good I had seconds and was just feeling comfortably numb when disaster struck. A call to get on deck and not five minutes later I was out on the bowsprit with Bryan and Thanny getting ready for a jibtop drop. It all went well though and a night of great moonlit sailing in fair swell was to follow. In other news, the sail repair program is going well and the mizzen should be ready to go again tomorrow thanks to some yeoman work and brave endurance stitching today from several members of the crew. We flew the Reacher 3 for a while this morning with the Trysail which gave the helmsman a hard time. A bit of up in the air action today too with myself, Alan and Bryan taking a mast each for a full rig check.